A few weeks ago, I visited Kuala Lumpur as part of a two week holiday in Malaysia. The Petronas Towers are the city’s emblematic landmark . Several bars can be found in the neighboring skyscrapers with a spectacular view over them. While the sight is admittedly impressive, it’s well worth it exploring other neighborhoods of the Malaysian capital, going as far as to its outskirts. 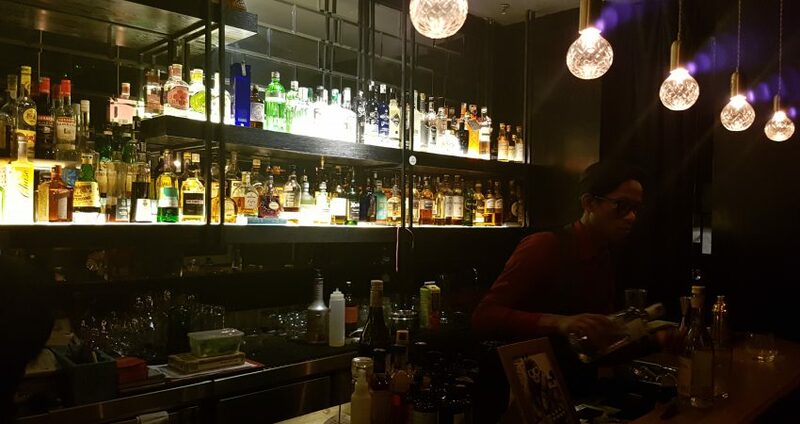 The residential suburbs are indeed home to excellent coffee shops, restaurants (I enjoyed a wonderful Malaysian dinner at LoKhaba in Bangsar Baru) and bars, including an awesome speakeasy. 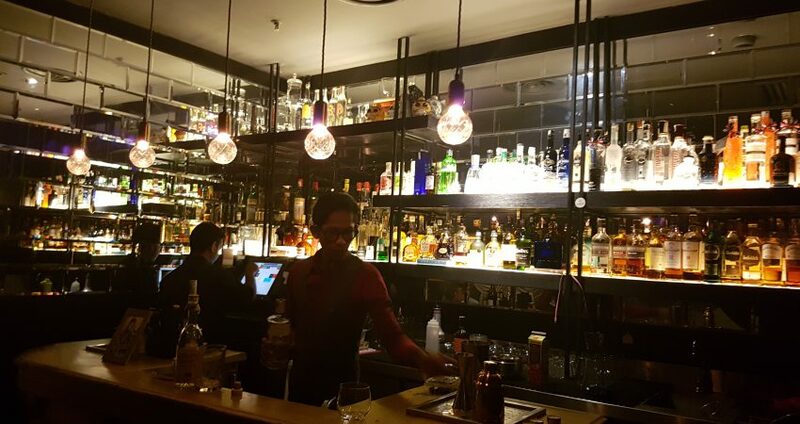 Hidden in Bangsar, the speakeasy bar Mr Brooks is one of the many venues opened in Kuala Lumpur by The Big Group, “a collective of eclectic food and beverage concepts” in KL, Penang and Ipoh. It was recommended by a friend of mine who used to be bar manager there and appears in many “best bars in KL” listings so I had to visit. The indications to find Mr Brooks’ entrance are rather cryptic: “the surreptitious location is merely landmarked by a Sunbeam Alpine sitting in the garage outside.” When my friend and I arrived in front of a luxury shopping mall, we were a bit perplexed. We turned around in front of the building looking for a parking but couldn’t see any. We ended up asking a security guard who directed us towards the mall’s…no I’m not going to tell you where the bar is exactly! All I’ll say is that we were left even more confused but, well, the search is what’s fun with speakeasies! 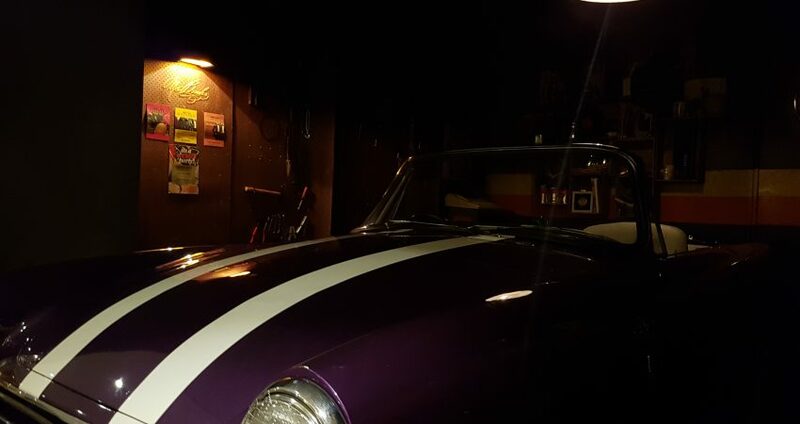 We finally found the garage – beautiful vintage car included – and, after struggling a little to find the door, entered Mr Brooks and joined other friends who were already waiting for us inside. The last friend to join us simply called the bar to get the directions to… Nope, still not telling you where the bar is! You’ll have to find it yourself! 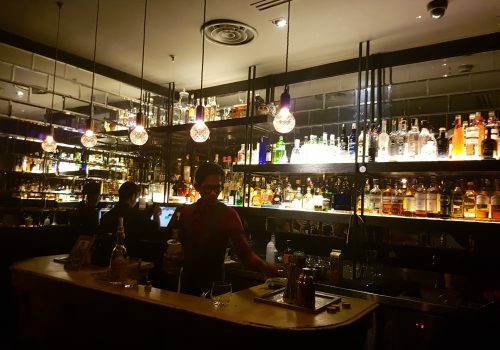 The first sight that greets you is the small, beautifully illuminated bar station with its mirror tiled walls. 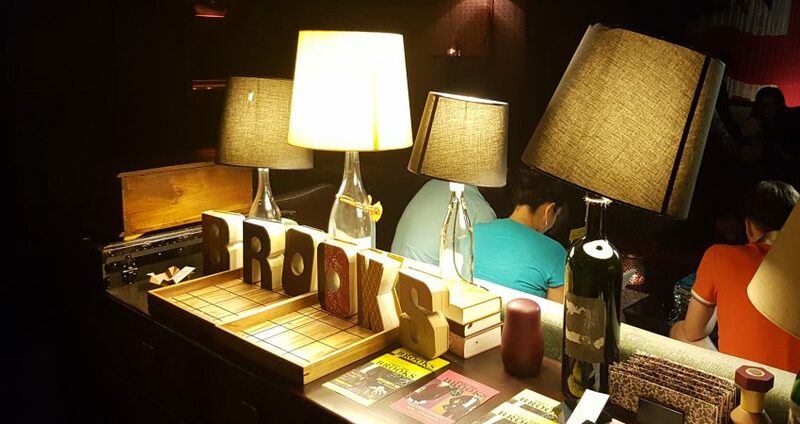 Walk along and either sit at one of the tables facing the bar where you can watch other people looking for Mr Brooks through the one-way mirror wall or proceed to the next two rooms with their retro furniture reminiscent of the 1960-70’s. 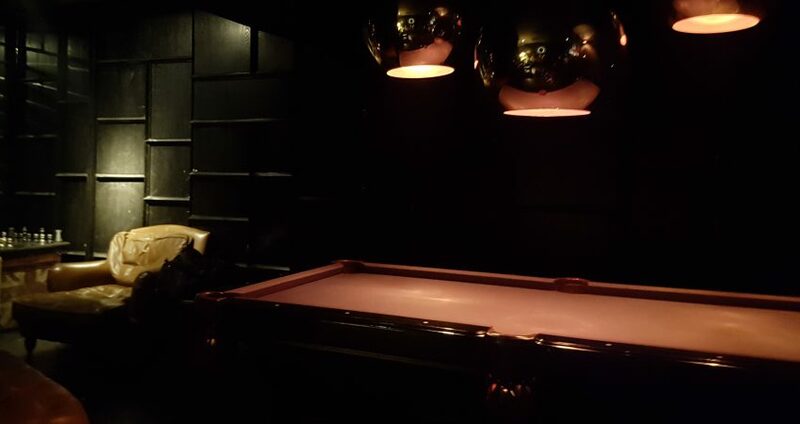 There is also a pool table for those who fancy a game of billiard! Even though we visited on a Monday, several tables were busy with customers. At the entrance, there were three businessmen presumably enjoying a post work dinner drink; behind our group, there was another group of friends; finally a couple sat in the smoking section. The atmosphere was laid back, a bit quiet but it was a Monday after all. The fairly classic looking menu offers a nice choice of spirits and creative cocktails to entertain all palates. It includes drinks such as the Marmalade Gin Sour (Tanqueray 10, lemon, orange marmalade, egg white, Angostura bitters), the Ron Ron Baby (Ron Zacapa, Drambuie, Amaro Montenegro, lime juice, honey, grapefruit), The Suspect (Hendrick’s gin, dry vermouth, Chartreuse jaune, lemon, cucumber) or the sweetly named Nan’s Carrot Cake (Ketel One vodka, Drambuie, gingerbread syrup, carrot juice, egg white, cream and a dash of nutmeg). Smokers can choose cigars from the menu and enjoy them in the smoking section. My friend ordered The Botanistar, a potent concoction made with Botanist gin, Grappa invecchiata, Pimm’s n°1, elemakule tiki bitters, infused red wine, grapefruit and star anise. As for me, after much hesitation, I finally opted for a Passionate Monkey (Monkey 47, Cointreau, Angostura orange bitters, grapefruit and passion juice), a light and fresh drink. The others had (apparently delicious ) Manhattans and wine. I would have loved to try another drink on the menu but, unfortunately, it was getting late and we had to wake up early the next day to travel to the tea plantations in the Cameron Highlands. 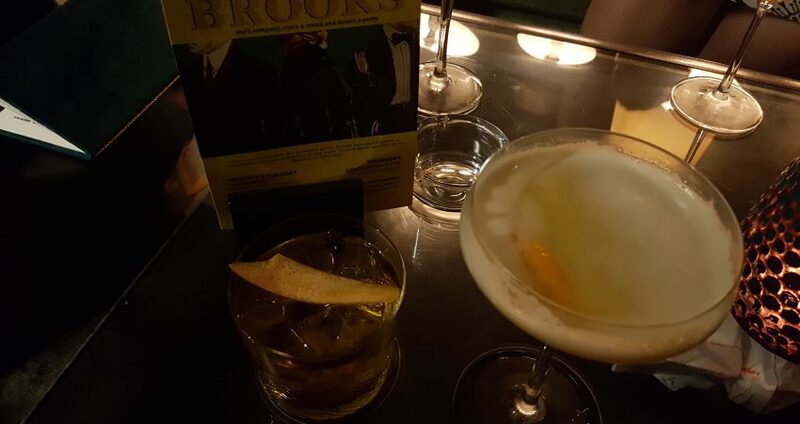 I really enjoyed this short visit to Mr Brooks and the bar’s laid-back atmosphere. I’ll try to return on another trip to Malaysia and make sure I visit the dozen other bars I saved on my Google Maps!